Xbox One and SmartGlass - a match made in heaven? 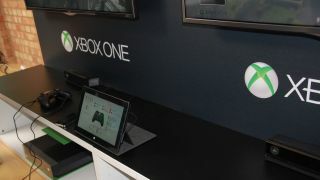 The man behind SmartGlass for Xbox One has told TechRadar that the second screen service for the new console will be a huge step on from its current Xbox 360 incarnation. SmartGlass has picked up largely positive reactions since arriving for Xbox, but Ron Pessner explains that changes needed to be made to improve the service – which is a free app available for tablet and smartphone. Xbox One should take advantage of a much more integrated SmartGlass, and Pessner is enthusiastic about the future of the technology. "At a high level what we aim to do is turn any smart device into a wonderful companion for the Xbox One," he told us. "It should be a second screen that is tuned to what the users are doing and keep them engaged even when they are not in the living room. "I would say you should think about it as a long tether to your console that extends the experience." One of the problems with the Xbox 360 SmartGlass was how long it took to sync – something that Pessner and his team have worked hard to fix. "The pairing should feel almost magical," he said. "It should be really delightful, like when you take your laptop home and it automatically connects to your Wi-Fi. "As proud of we are of the Xbox 360 SmartGlass one of the main pieces of feedback was around the connection latency time – but now it should feel instantaneous." New functionality is key to the latest SmartGlass and Pessner believes that pinning and sharing content when out and about will prove popular, as will the game DVR – allowing easy sharing of gaming clips amongst your network of friends. TV functionality is another key feature – although it will be limited to the US market at launch with promises that it will come to other territories such as the UK and Australia at a later date. The Kinect's IR blaster is central to this and Pessner insiseds that testing has shown that the difficulties in getting blasters to work consistently are not a problem for the device. "We've been really impressed with the IR Blasting capability," he said "We're pretty excited with what the IR blaster in the Kinect can do." Pessner has a personal favourite feature that is on the way: the ability to use the SmartGlass to get help and tips that take advantage of knowing exactly where the player is in the game. "I'm really excited about this," he said, "to the extent that I'm being teased about it in the office!" "I love that SmartGlass taps into knowing where the user is and it can use the second screen to allow you to get help. I'm a huge advocate of that contextually relevant help." After revelations that the Xbox One will allow eight controllers to simultaneously connect to it, SmartGlass goes one better – or two times better to be exact – by allowing 16 devices to be synced with the console. Useful for 'party type scenarios' says Pessner. But what about those people that have not got a smart device – does it put them at a disadvantage?
" I don't think so," said Pessner, "although we have researched and remain thoughtful in terms of how we design the experiences. "The goal is clearly to build differentiated value - we want to demonstrate huge value to customers if they pair their device to the Xbox and make it a habitual thing that they do." Some of the examples of Smart Glass integration that TechRadar has already seen demonstrated include the use of the tablet as a mission map, as a way to personalise your character while you were out and about and, interestingly, to 'ring' you during missions. A second screen is certainly a fascinating option and although a lot will be dependent on the developers to take advantage of the situation we are keen to see just how integral it can become.